Another Harlem restaurant coming to 115th and Frederick Douglass Blvd, Made En Harlem sign says | HarlemGal Inc. 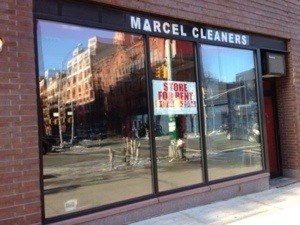 Remember where Marcel’s Dry Cleaners used to be on 115th and Frederick Douglass Blvd in Harlem? Apparently that commercial space is being prepped for a restaurant, according to the public notice taped to the glass door. 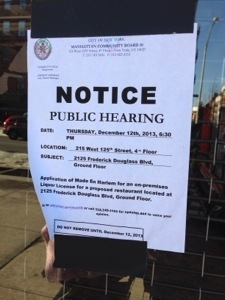 It says on the notice Made En Harlem has applied for a liquor license. Hmm? Interesting. This area of Harlem keeps getting restaurant after restaurant. That’s why this blogger was the first to dub FDB as Harlem’s restaurant row back in 2008. She saw it then and called it! Feel free to check the records please! As soon as we know more about this place, we will pass along the info! This entry was posted in Harlem and tagged commercial space, Frederick Douglass, Harlem, harlem restaurant row, Made En Harlem, restaurant row. Bookmark the permalink. The name of this restaurant sounds almost as low brow and ridiculous as that “Footin’ It” nonsense low brow restaurant that opened up this year on Lenox and 117th and quickly closed.. Right across the street a 115 St Corp applied for a liquor license last week as well. Any idea on what that type of restaurant either will be?